Did you pull out all the Christmas decorations this weekend? I started but this wreath is about as far as I got! A few years back Starbucks hung these on all of their doors and throughout the store. I loved them and immediately thought "I could MAKE that!" So I did. I like this project because it was super quick and simple, it'll probably only take you an hour or two. Plus, I could get everything I needed in one place (Joann's or Michael's) and it's something I can use year after year! Supplies: -Glue gun - wreath form - ornaments & jingle bells in various sizes of red and green - Styrofoam balls in various sizes. I used between 15-20 per wreath - 4 (more or less) skeins of yarn in various shades of green. I also tried to get them in different weights and textures. Grab a few that are fuzzy for a little extra interest. Wrap just enough yarn around the Styrofoam balls to cover the ball. 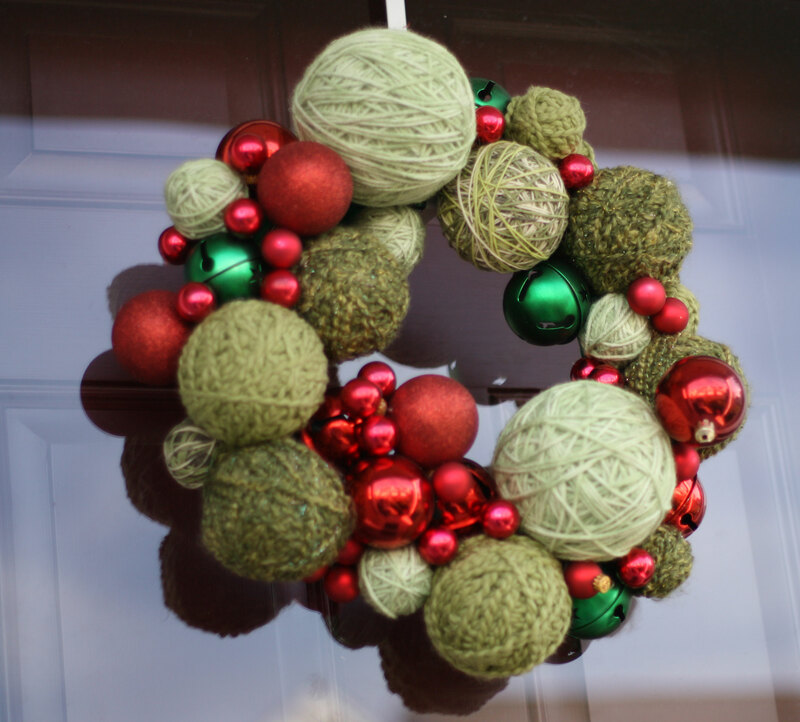 Then hot glue the covered yarn balls to the wreath form. I started by placing the larger balls first and then filled in gluing the ornaments, jingle bells and smaller Styrofoam balls to the form to cover. I used 4 different shades of green yarn but you can use more or less. You should have enough to make at least 2 wreaths. It also looks great in cream & gold, all reds, all greens, or light blue & white. If you make this - make sure to email us your photos! We'd love to see. Looking good, Kara! I had high hopes of finishing our Christmas decorating on Friday, but only got the mantle done. Still happy with that- went with a different color scheme this year and I’m liking it so far! Hoping to finish it all up this week.